Alice Archer joins us today to chat about the character that found her in new book Everyday History. Welcome to the Everyday History blog tour. I send a big grin of thanks to Dreamspinner for including me here, and to Bree Archer for creating the perfect book cover for this story. In today’s tour stop, I’ll tell you how the story was unexpectedly hijacked. Everyday History is about the chances we pass up, the magnetic force of true love, and how much we’re willing to do to deserve a second chance. The two main characters are Henry, a shy history teacher, and Ruben, a headstrong young man who is surprised by the force of his crush on his teacher. Henry is scrupulously responsible, however, so it’s not until after Ruben has graduated that Henry even acknowledges the chemistry between them. Henry looks the way he does and has various traits because of a rogue postcard that reached out, took me by the throat, and wouldn’t let go. About halfway through the process of writing Everyday History, I went into a bookstore and ran into Henry. That’s how it felt, anyway. I’d gone into town to do some errands, and Rombach, one of the big bookstores in downtown Freiburg, Germany, called to me, as always, so I went in to lose myself and find myself for a while. Happy and content, I flipped through a container of book-related postcards as I waited in the check-out line. I flipped to the next postcard and saw… Henry. Indisputably. Unequivocally. Remembering that moment still makes the hairs on my arms stand up. You can take a look at the postcard – and Henry – online, here. It’s put out by Gutrath.com and the photo is by Ben Hupfer. I yanked the card out of the container, pawed through to find more of them, then straightened up and looked around. I wanted to grab someone – anyone – and make a scene, share the treasure I’d come across, tell them what it meant to me. But the people nearby were either wide-eyed tourists or close-faced Germans (they’re not being rude; they’re just private), I settled for hugging the postcards to my chest and grinning like a fiend. I call the finding of this postcard of Henry a hijacking because until I found it – or it found me, which is more what it felt like – Henry wasn’t bald and he didn’t have deep blue eyes or ears that sort of stick out. Also, this postcard inspired the scene in the book where Ruben takes a surreptitious photo of Henry carrying a stack of books. With the postcard in my hand, I knew that a bunch of things in the overall story had to be (seriously, had to be) adjusted and revised and tweaked to make them more… true. The other major story hijacking occurred because of James Morrison’s album The Awakening, which I listened to on automatic repeat for months as I wrote. I don’t think I listened to anything else during the writing of Everyday History. A friend of mine in a creative play group I belonged to showed me a music video online of Morrison singing a song from this album and I got hooked. I was deep into writing Everyday History by that time, and the album just seemed to fit the story. It complemented the themes and mirrored a lot of the emotions I was working with as I wrote. So I kept listening to it. The Awakening hijacked Everyday History in ways that were more subtle and pervasive than the Henry postcard, because the album’s lyrics and the feelings they evoked circled in my brain and my heart as I finished and edited the story. I loved how I’d be sitting in my chair, staring into space, searching for a bit of inspiration in a scene that felt tricky, or stretching for a better word, and Morrison’s lyrics would deliver it. Right then, right when I needed it. It was spooky and perfect, over and over again. So I let him have his way with me, and kept listening. Everyday History would be a different, less inspired, novel if it wasn’t for Ben Hupfer’s photo or James Morrison’s album. I can’t thank them enough for taking over my process and capturing my attention, because they reminded me to stay open to inspiration’s presence – everywhere, anywhere, anytime. 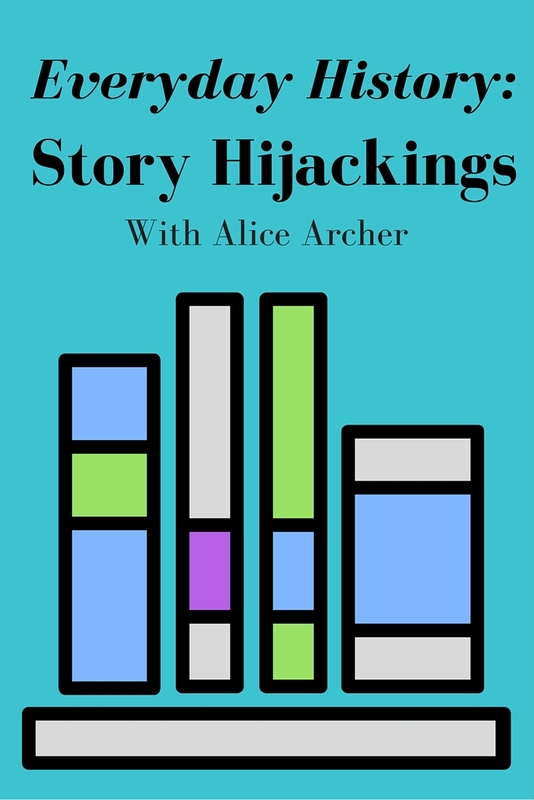 What’s your story of an inspirational hijacking? I love to hear tales about the muse in action in people’s lives. I’ll continue the hijacking theme with the excerpt below. The story begins with Ruben walking into Henry’s classroom and capturing his attention. Every fall I begin the first class of the school year the same way. I’m not fool enough to think the students entering the Boston Museum of History’s internship program—high school seniors selected for their drive and intelligence—won’t want to test me. So I offer them a challenge. They always leap, assuming they’ll win. They won’t. Not the way they expect to. My glasses and bald head, the way I dress—in tweed vests and ironed shirts, like a stereotype of a museum curator—work in my favor, keep me from being a threat. I stand behind my desk, hands clasped at the small of my back, suppressing a smile as the students enter the classroom for the first time, stealing looks at me, loud and boisterous to cover their nerves. They goof around, point at the unusual art I’ve packed into the room, and peer into the empty inkwells built into the tops of the old desks. I want to smile because I know something they don’t, something they think they already know. They’re here because they think history is interesting. But I can make them fall so in love with history that the way they see themselves will shift forever. Then he walks into the room with his arm around a beautiful girl. His exuberance is incandescent. He doesn’t simply enter the classroom, he radiates into it, vibrant with life, as though fueled by an energy source of pure dazzle. His effect on his classmates is instantaneous. Girls shamelessly bat their eyelashes at him. Boys jostle and joke. They slap him on the back, vying for his friendship. At least one of the boys bats his eyelashes, but he doesn’t seem to notice. At first I think he’s going to be a disciplinary problem, but he’s the opposite. He holds out a desk chair for a pretty girl with red hair and then brings the other students into line by cajoling them into settling down and paying attention. I blink, give myself a mental shake, and get down to business, starting with roll call. His name is Ruben Harper. Check out Everyday History today! Heyley, it’s been a pleasure working with you on this and the blog tour. I really appreciate all your work, and your patient answers to my questions. I recently received a message from Klaus, in Germany, who chooses postcards for Gutrath, the company who distributes the postcard of Henry I was hijacked by. Klaus told me he was very happy that one of their postcards had helped me to see Henry. What a great thing to reach out and let me know. Thanks, Klaus! P.S. Hayley, pardon me for spelling your name incorrectly in the comment above. i am reading this impressive educational post here at my house.